Dower chest carved 1947 for Nora and Tulloch Field . Who was Nellie Payne? 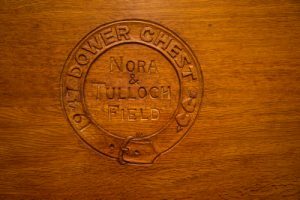 Dower chest for Nora and Tulloch Field. Close up inside lid Nora and Tulloch Field dower chest. Close up date on Nora and Tulloch Filed’s dower chest. 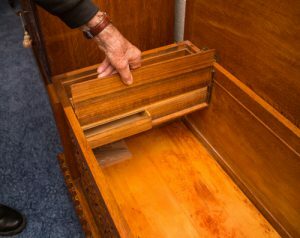 Secret drawer in Nora and Tulloch Field’s dower chest. This chest is unusual in two ways –firstly the lady’s name appears to have been changed and secondly it has a secret drawer! Tulloch Field’s parents were Norman C. Field and Adeline Field (née Sadler). Tulloch Field’s grandparents were Mary Annie Field and J. Charles Field (they were cousins who married). Mary Annie Field was Nellie’s second eldest sister, which therefore makes Tulloch Nellie’s great nephew. This part of the family belonged to the “Woodfield” branch of the Field family. 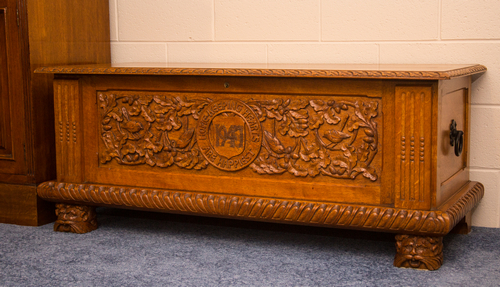 We believe this chest was carved for the wedding of Nora and Tulloch Field. 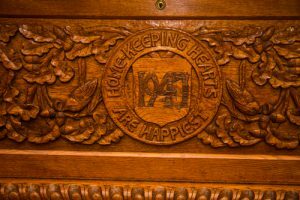 The reason there appears to have been a change in the ladies name is that Tulloch Field was engaged to another lady (we think with the name of Marie) and it appears as if Nellie was carving the dower chest for their wedding. For whatever reason this wedding didn’t eventuate, instead Tulloch married Nora Travers whose husband Bill had been killed in the war and they had only been married for a couple of years. Nora’s maiden name had been Hall. As for the secret drawer, we don’t know why this was put in this dower chest! Nellie also carved a set of bookends for this family. Descendants of Nora and Tulloch decided to sell both the dower chest and bookends. They were put through Gowans Auction House in Hobart and we have not found who bought the bookends, but we at least have an auction catalogue photo of these with the beautiful robin red breast carved on them. 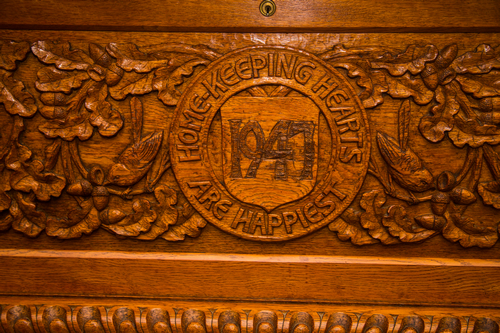 The dower chest has a lovely story to go with it. The Nellie Payne subcommittee did a story in the Examiner about the exhibition and a gentleman read that story when he luckily stopped at Campbell Town for a coffee (and a read of the Examiner) on his way home from Launceston to Hobart. He contacted the Nellie Payne subcommittee to say that he had a dower chest that was carved by Nellie!!!! How lucky was that!!! It was purchased by the couple who have a love of antiques and knew of Nellie’s wonderful work, although they didn’t own any of her work. The ladies mother had passed away leaving her a small amount of money. They decided to buy a lovely piece of furniture that they could look at and be reminded on a daily basis of her dear mum. They saw the piece at the auction, and although it was passed in, they negotiated and purchased it later.